Matt Fitzgerald is perhaps the most prolific endurance sports writer in the business. 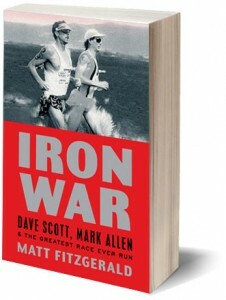 Usually he’s providing terrific instructional advice on training and nutrition, but in his new book IRON WAR he tackles the narrative form, providing a richly-detailed account of the 1989 Ironman championship. That year, Mark Allen finally overcame longtime rival Dave Scott to win triathlon’s coveted title in an epic showdown in Kona. Fitzgerald examines what drove the two most decorated triathletes in the sport to greatness. The result is a gripping page-turner, even though the reader knows who will win. Fitzgerald recently joined us to talk about IRON WAR on The Fitness Buff Show. You can listen to that broadcast HERE.